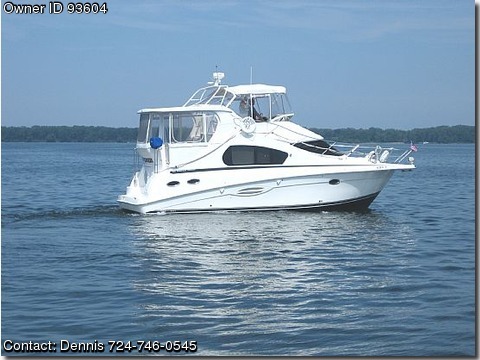 Call Boat Owner Dennis 724-746-0545 412-996-2084 Description: Only one owner. New canvas and eisenglass and carpeting 2012. 100 hours on engines and less than 30 hours on generator. Has the following options DECK FEATURES Aft deckhardtop, Anchor roller wflange, Bow pulpit, Electrical storage locker, Swim platform wladder, Transom shower Wet bar. CABIN AMENITIES Convertable sofa, Custom blinds, Designer curtains matress covers and throw pillows, Cherry cabinetry, carpeting, lockers, window screens, 2 staterooms w queen size beds, 2 full heads with showers and more. GALLEY Electric range, refrigeratorfreezer, microwaveconvection oven, corian countertops. ELECTRICAL EQUIPMENT ACDC Converter, 12V 120V circuit breakers,2-30 amp dockside power cords, GFCI system,7.3 gas generator. MECHANICAL SYSTEM Dripless shaft seals,Duel lever throttle and transmission controls, engine hour metters,fresh water cooling system, 2-150 gallon aluminum fuel tanks,holding tank, 2-water tanks,Hydraulic steering, Macerator pump, Manganese Bronze reuuders and struts, SS props.,Hotwater heater and much more. SAFETY EQUIPMENT ANCHOR rode, Anti fuling bottom paint, Battery safety switches, Bonding system, Carbon monoxide detectors, compass, Engine alarms, fenders, lines, life jackets, fire extinguishers and fire extinguisher system for enfgine room, Gasoline fumehigh water detectors. OPTIONS Aft deck encosure, Air conditioningheating system 3 zones,3-AMFM stereo systems, Anchor windlass, Bridge enclosure, Central vacuum system,Radar, Cahrtplotter, Autopilot,marine radio, exterior carpet, Generator, Icemaker, Internal sea strainers, oil X change system, radar arch, Remote spotlight, 12-20" TV, 2-15" TV, Ultra leather dinette and sofa, Fresh raw water washdowns.